J&J RV Park provides high-speed wireless internet for all of our guests. Our Pull-throughs and back-ins are a whopping 30 feet wide. You can park your toad right next to your rig. Brand new pedestals with the power you need at each site. Near downtown restaurants, shopping, souvenirs, gas, etc. We really have the freindliest staff around! Our RV park has everything you need to ensure your stay with us is as comfortable as possible. 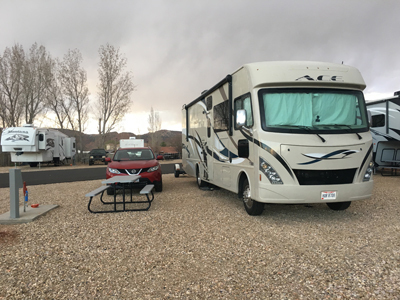 J&J RV Park has on-site showers and is located in beautiful Kanab, Utah within easy walking distance of restaurants, a laundromat, grocery stores, and more. 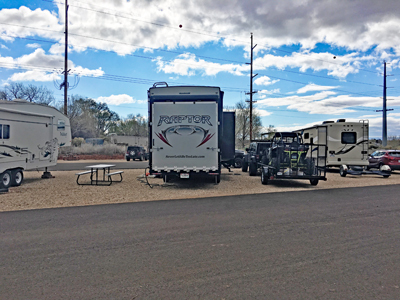 Our extra large RV lanes can accommodate almost any size of rig, and our park has full electric, water, and sewer hookups for your RV, plus free camp-wide wi-fi! If you have any other questions about our park, please contact us. We look forward to seeing you soon! Each site has plenty of room for the toys. A 30 foot width is about the largest anywhere.